I'm currently working on a quilting book (one month to go and it's due!) and so I decided to test six common fusibles in a small table runner. I have used all of these in the past except for Soft Fuse. I had such a fun time using this brown batik as a basket/planter box. I love fussy cutting geometric prints. I started by picking a flower to use and making six of them using the exact same fabrics. 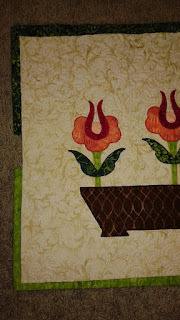 I used a stabilizer to do my usual double blanket stitch applique. I then ripped away the extra stabilizer and started playing with the table runner. There are two that seem much thinner and a little less stiff than the others: Heat and Bond Featherlite and Steam a Seam 2 Lite. The others are all thicker. You can tell when you bend the fabric. I also did the big brown planter in Wonder Under and ripped the stabilizer away from the back to see if that made a difference. It was thinner, but still stiff. 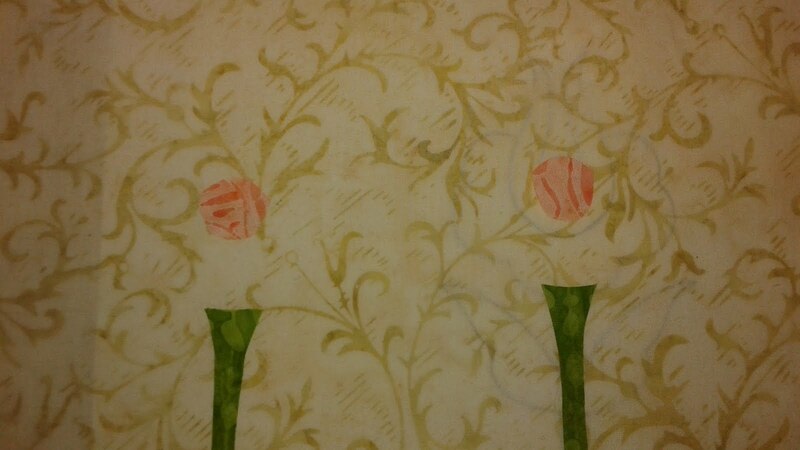 If you look carefully at he right flower above, you can see that I have the pattern underneath my background fabric. I've traced the pattern in a thin black sharpie so I could see the pattern through the fabric. This worked great....until I added the stabilizer underneath! 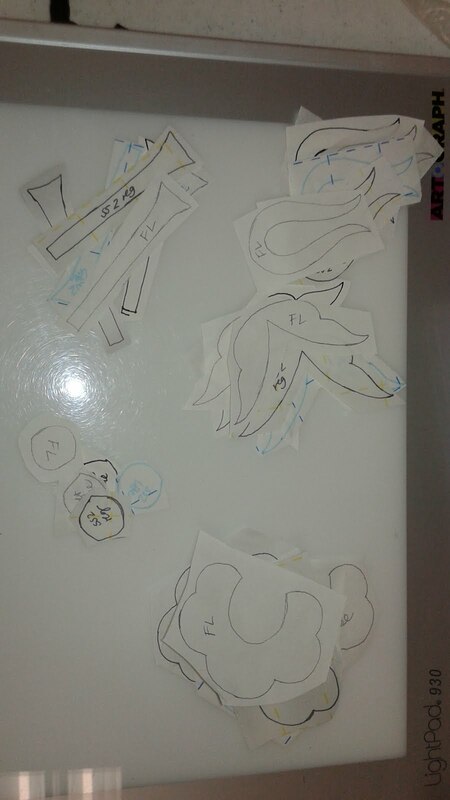 Then I couldn't see through anymore and had to use a lightbox to place my pieces. As I was stitching all the flowers I followed the package directions. I did not have any trouble with any of the fusibles not sticking or wrinkling, or falling apart. HOWEVER, I have used most of these in the past and I still have a favorite: Steam a Seam. The main reasons I like steam a seam are: 1. You can stick the pieces to your background and move the block from place to place without the pieces falling off. 2. You can reposition or take the pieces off with ease. 3. It sticks well. I have used both the regular and lite weights. 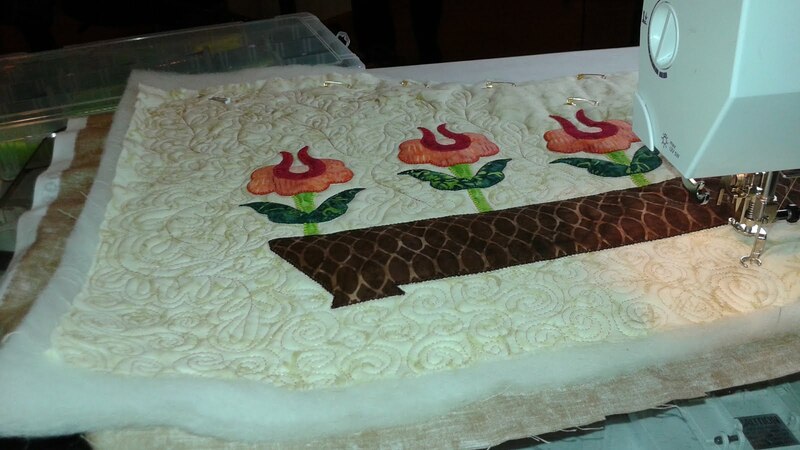 I usually use the regular, but am coming around on using the light after quilting a quilt with a lot of fusible! I have had many problems with Heat and Bond Lite and Featherlite not sticking well or coming off the tips of the pieces. It's not something I plan to use a lot of. I do like Wonder Under and have had much success with it, However, I do a lot of symmetrical applique and I want to know my pieces are going to stay put. So I plan to stick with Steam a Seam for now. 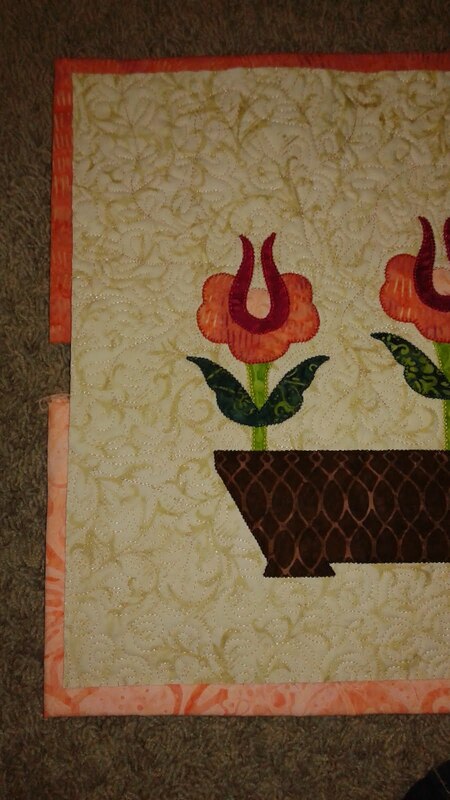 The next step will be to quilt this little table runner and see what happens and how the fusibles differ. I'm very curious what it will be like to quilt around/though all the different fusibles I used in my last post. I started quilting last night hoping to finish for the post today, but I didn't quite make it. Here's what progress I've made and what I've learned so far. When I quilted around the edge of each block I had no problems. There was not a noticeable difference between brands of fusible. I have yet to try quilting on the actual flower. Hopefully I'll be able to let you know what happened next time! I've been playing with Christina Cameli's new book on free motion machine quilting. 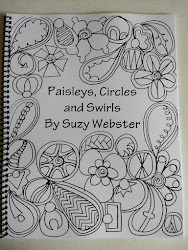 The above leafy design is from her book. It's fantastic and if you love to free motion quilt like I do I highly recommend it! Fusible Test...How did it Quilt? Steam-a-Seam 2 Lite and Heat and Bond Featherlite are the least stiff. I like the Steam-a-Seam because you can stick it on the background and the fabrics stay in place. 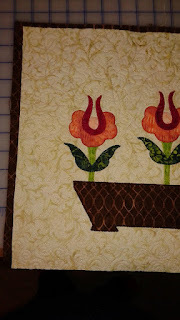 When quilting, I didn't notice a big different in it being easier to quilt around one fusible or another. All six stuck well for me this round. I followed the package directions for each product. That being said, I have had trouble with Heat and Bond not sticking in the past. If you want more specifics about the first part of this test click here. Someone was also asking me about whether they adhered well and if they were fraying. I just took a careful look and none of the fabrics are fraying, they all adhered well, and I didn't have any trouble with them lifting while I was sewing. I did use stabilizer behind all the flowers. 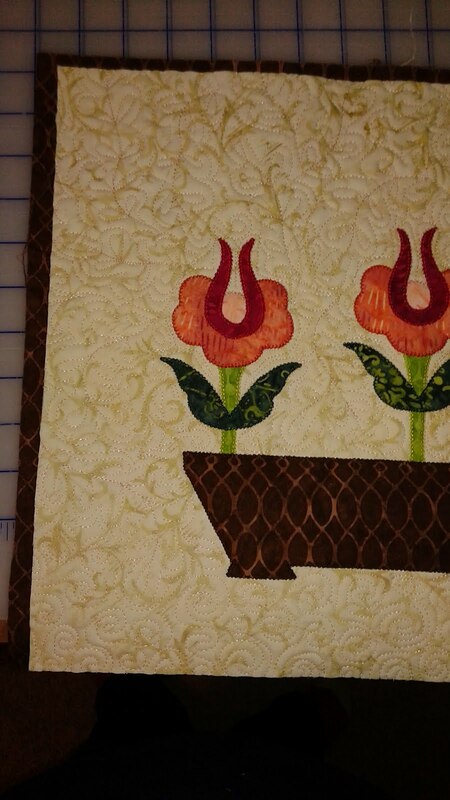 I used a design from Christina Cameli's Step-by-Step Free-Motion Quilting for the background fill above the planter and simple swirls for below the planter. 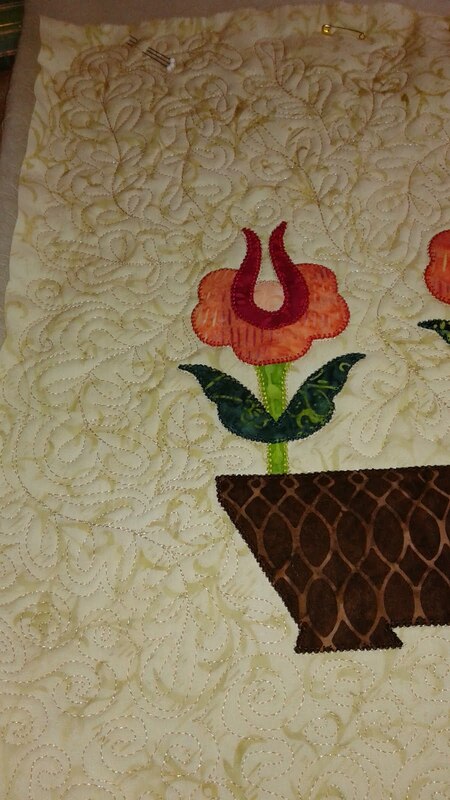 I used a slightly off color tan so you could see the quilting. This is one of my favorite things to do. Why do all that work if you can't see it when your're done? Next, I had to pick a fabric for binding. I like to use color if at all possible for bindings because I think it adds a nice frame. Dark peach binding, yummy. Light peach binding, too pale. It kind of clashes with the background fabric. Green binding...it makes the stem and leaves stand out, which is not what I want. Dark peach it is. 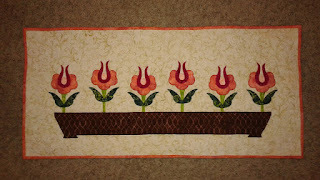 And here is the finished table runner! 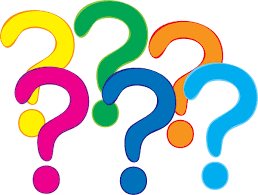 Do you have any favorite fusibles? Why? I'd love to know!